The new Yakuza game will be out in Japan in Spring, and it looks like Sony will be releasing matching PS4s around the same time. 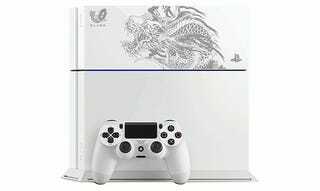 The consoles will cost ¥41,980 ($350), coming in two editions, named after Yakuza Zero's two protagonists. In addition to that, each edition will be available in both Glacial White and Jet Black, which makes for a total of four tattoo/color combinations. The Yakuza Zero Limited Edition PS4s will be out in Japan on March 12, with no indication of a Western release. If they do make it over here, hopefully we'll get a Yakuza game to play on them, too.